Item #12425: 18Kt. Yellow Gold two Piece Wedding Ring Set Semi-Mount for 6-7mm Round Stone with eighteen channel set Round Diamonds of .41 cts. TW. Size 5 3/4. Item #16831: 14Kt. White Gold Wedding Set Semi-Mount with two bezel set Square Diamonds and sixty bead set Round Diamonds of .25 cts. TW; Size 6 3/4. Item #13581: 18Kt. 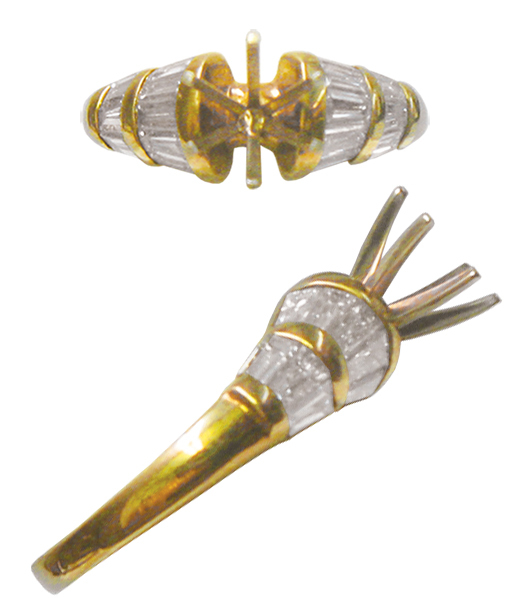 Yellow Gold Wedding Set Semi-Mount for 6mm Round Stone with two prong set Marquise Diamonds of .33 cts. TW; Size 6. Item #13581: 18Kt. Yellow Gold Wedding Set Semi-Mount for Round Stone with twenty-six channel set Round Diamonds of .34 cts. TW; with White Gold prongs. Size 5 3/4. Item #14800: 18Kt. Yellow Gold & Platinum Semi-Mount Ring of 13.35 grams for 6mm Round Stone; Size 6 .